Those in the northeastern states have a typical culture of their own and have a proud history to recall. With a long ethnic background and linguistic tradition, Assamese have a lot to choose from while naming their children. Nouns that describe nature, flowing rivers, human virtues and myriad adjectives of Hindu Gods and Goddesses are common in Assam and parents don't hesitate to name their children as per their desire and in conformity with tradition. Every member of Assamese family pampers the mother who has given birth to a child. Her health is taken care of by elderly women in the household. Her dietary needs are fulfilled on time and she is made to listen to recital of religious books and scriptures. The mother is considered impure for a month after the child birth and hence, she is not allowed to touch anything in the house. A fire is kept burning near her to drive away evil spirits. After the first month, the suddhi ceremony is held to purify both mother and child who are then allowed to mingle with others. The baby's head is shaved off in this ceremony. Another novel custom is that Lalungs (a sub-community) have their child brought outside the house by its mother in the morning after washing clean and make the child to face east. A women priest helps the child to touch the specially made bow and arrows and then she shoots four arrows in the four corners and praying for the God to protect the newborn from calamity or ill-health. If it is a girl child, she is touched with a piece of cotton and a sickle instead of with bow and arrows. "Your struggle is outside the house", is whispered to the boy and "your struggle is inside the house", to the girl. Rituals for the newborn like namakaram, chudakaram and annaprasam are observed by Brahmins as per Vedic rites. While only annaprasam is followed by non-Brahmins in Assam when the baby is at its fifth, seventh or ninth month. Usually the maternal uncle puts the first morsel in the child's mouth followed by a feast and a group prayer by relatives and parents together. Some Buddhists in Assam undertake a purification ritual for both mother and child like Dowaniyas who seek the help of a priest to perform these religious edicts. Fakials, a sub-sect of Buddhism, take the baby to an elevated verandah of the house built on high poles after seven days and bring the child down to the ground after a month. 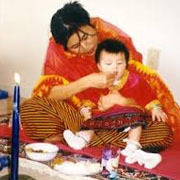 The elderly women in the household tie black thread to the child's hands and legs wishing it a prosperous life.